Antarctica was first sighted by explorers when Alexander Island was discovered on January 28, 1821 by a Russian expedition under Fabian Gottlieb von Bellingshausen who named it Alexander I Land for the reigning Tsar Alexander I of Russia. This discovery was quite different from the “discovery” of Australia or the Americas. In those cases those continents were inhabited and the “discovery” merely meant that Europeans found what other people already knew existed. To the best of our knowledge, no one knew Antarctica was there and Bellingshausen (and crew) was the first human ever to lay eyes on it. 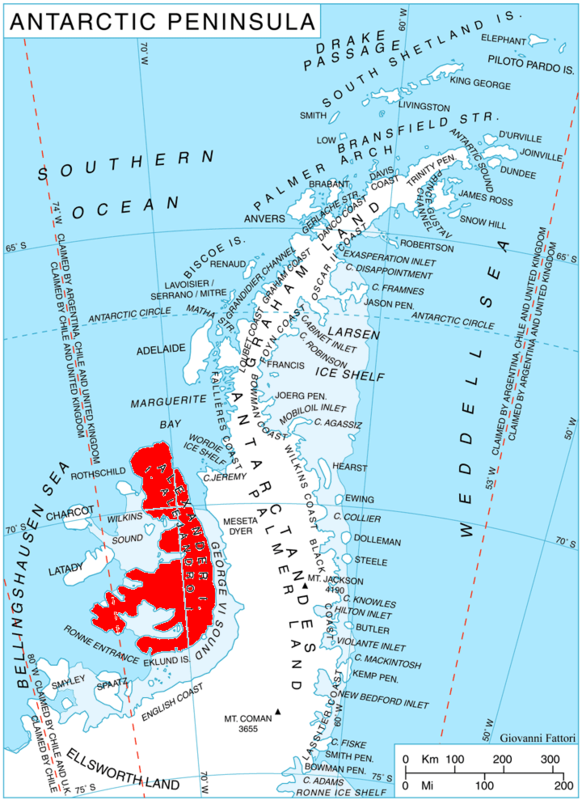 Alexander Island was believed to be part of the Antarctic mainland until 1940. Its insular nature was proven in December 1940, by a two-person sledge party composed of Finn Ronne and Carl Eklund of the United States Antarctic Service. 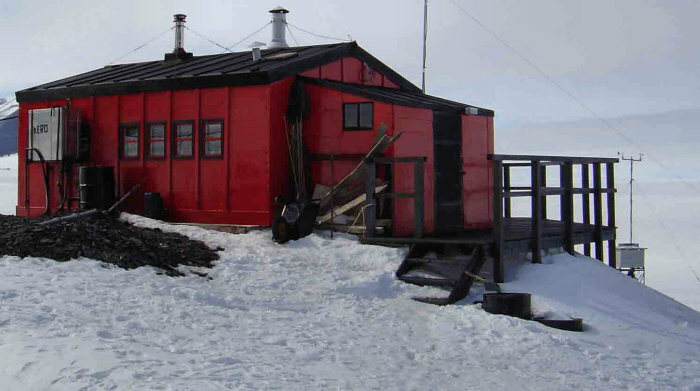 In the 1950s, a British base administered as part of the British Antarctic Territory was constructed at Fossil Bluff (Base KG). Fabian Gottlieb Thaddeus von Bellingshausen (1778 – 1852) was an officer in the Imperial Russian Navy, cartographer and explorer, who ultimately rose to the rank of Admiral. Bellingshausen started his service in the Baltic Fleet, and after distinguishing himself, he joined the First Russian circumnavigation in 1803-1806, where he served on frigate Nadezhda under the captaincy of Adam Johann von Krusenstern. After the journey he published a collection of maps of the newly explored areas and islands of the Pacific Ocean. Subsequently he commanded several ships of the Baltic and Black Sea Fleets. As a prominent cartographer, Bellingshausen was appointed to command the circumnavigation of the globe in 1819-1821, intended to explore the Southern Ocean and to find land in the proximity of the South Pole. The expedition was prepared by Mikhail Lazarev, who was made Bellingshausen’s second-in-command and the captain of sloop Mirny, while Bellingshausen himself commanded sloop Vostok. During this expedition Bellingshausen and Lazarev became the first explorers to see the land of Antarctica on January 28, 1820. They managed to twice circumnavigate the continent and never lost each other from view. Thus they disproved Captain Cook’s assertion that it was impossible to find land in the southern ice fields. The expedition discovered and named Peter I Island, Zavodovski, Leskov and Visokoi Islands, Antarctic Peninsula as well as Alexander Island (Alexander Coast). The island is now used as a meteorological centre and refueling base. It is claimed by the United Kingdom, for which it represents their largest remaining overseas island, part of the British Antarctic Territory. But ownership is disputed. For Chile and Argentina it is part of the Antártica Chilena Province and Tierra del Fuego Province respectively (as a component of the general dispute with Great Britain over the Malvinas Islands). 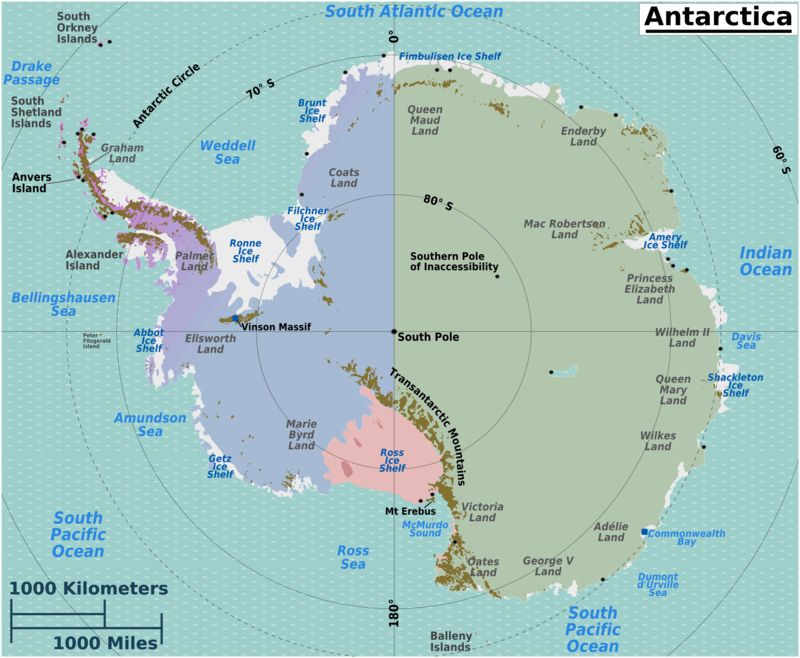 Alexander Island, which is also known as Alexander I Island, Alexander I Land, Alexander Land, Alexander I Archipelago, and Zemlja Alexandra I, is the largest island of Antarctica. It lies in the Bellingshausen Sea west of Palmer Land, Antarctic Peninsula from which it is separated by Marguerite Bay and George VI Sound. George VI Ice Shelf entirely fills George VI Sound and connects Alexander island to Palmer Land. The island partly surrounds Wilkins Sound, which lies to its west. Alexander Island is about 240 miles (390 km) long in a north-south direction, 50 miles (80 km) wide in the north, and 150 miles (240 km) wide in the south. Alexander Island is the second largest uninhabited island in the world, after Devon Island. 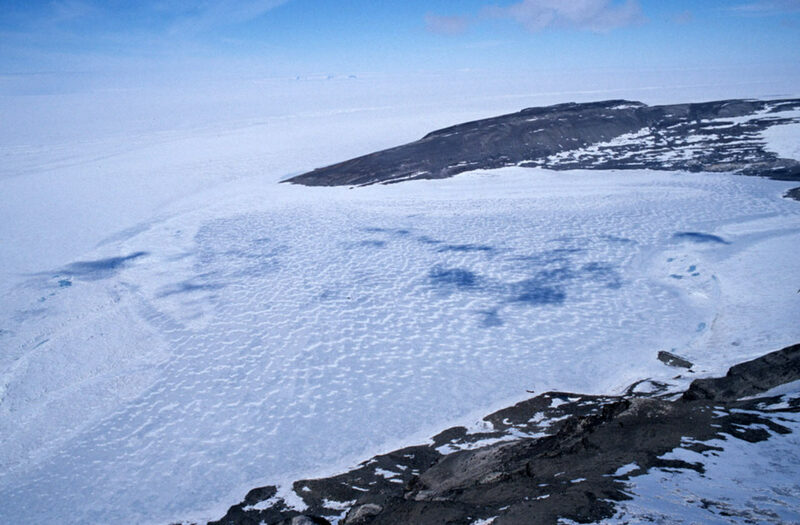 The surface of Alexander Island is predominantly ice covered. There exist some exposed nunataks (exposed rocky ridges) and a few ice free areas. The nunataks are the peaks of north-south trending mountain ranges and hills. They include the Colbert, Havre, Lassus, Rouen, Sofia University, and Walton mountains; Staccato Peaks; Lully Foothills; Elgar Uplands; and Douglas Range. 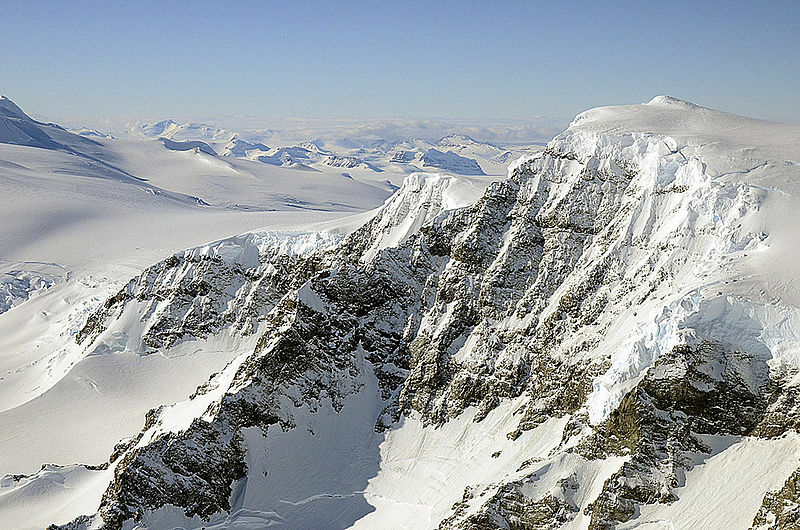 These mountains, peaks, hills, and uplands are surrounded by a permanent ice sheet, which consists of glaciers that flow off of Alexander Island. These glaciers flow west into the Bach and Wilkins Ice Shelves and Bellingshausen Sea, and east into the George VI Ice Shelf. The George VI Ice Shelf is fed by both by outlet glaciers from the ice cap on Palmer Land and Alexander Island. Another notable feature of Alexander Island is Hodgson Lake. It is a former subglacial lake that has emerged from under an ice sheet that covered it. It is 2 km (1.2 mi) long by 1.5 km (0.93 mi), and has a 93.4 m (306 ft) deep water column that lies sealed beneath a 3.6 to 4.0 m (12 to 13 ft) thick perennial lake ice. The northern side of this lake is bounded by the Saturn Glacier, which flows east into George VI Sound, while the southern side of Hodgson Lake is bounded by the northern face of Citadel Bastion. During the Last Glacial Maximum, Hodgson Lake was covered by the ice sheet at least 470 m (1,542 ft) thick. This ice sheet started thinning about 13,500 years ago. It retreated and left Hodgson Lake covered by perennial ice sometime before 11,000 years ago. This lake has been covered by perennial ice since that time. Two things were found out very early on in Antarctic exploration – that extreme cold makes people feel very hungry, and hard work such as that involved in traveling by dog sledge, or especially by manhauling uses a great deal of energy. This energy has to be replaced by eating enough, unfortunately the early explorers didn’t eat enough and suffered as a consequence. Early explorers also did not eat enough of the right foods and in consequence developed several ailments, notably scurvy. Here is a comparison of the ration list for Scott’s 1912 expedition and the normal rations for polar workers 100 years later. I discussed some of these issues in my post on the discovery of the North Magnetic Pole (1 June) and gave a recipe for pemmican, the longlasting dried meat and fruit combination used by indigenous peoples in the Arctic region, and adopted by polar explorers. Modern rations also call for muesli which is much like granola except that the oats are not toasted. So Muesli is even simpler to make than granola because all you do is mix dried ingredients together. Muesli was introduced around 1900 by the Swiss physician Maximilian Bircher-Benner for patients in his hospital, where a diet rich in fresh fruit and vegetables was an essential part of therapy. It was inspired by a similar “strange dish” that he and his wife had been served on a hike in the Swiss Alps. Bircher-Benner himself referred to the dish simply as “d’Spys” (Swiss German for “the dish”, in German “die Speise”). Muesli in its modern form became popular in Western countries starting in the 1960’s as part of increased interest in health food and vegetarian diets. Traditional muesli was eaten with lemon juice and not milk. It is certainly worth making your own because (a) it is cheaper than commercial brands (especially if you buy in bulk), and (b) you can choose whatever ingredients you want. 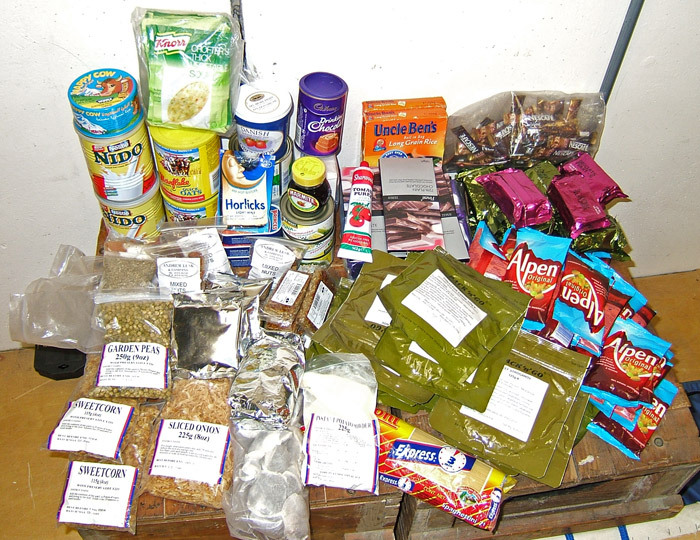 The only thing to bear in mind is that you need to keep a slight preponderance of oats over other ingredients, and since you are probably not heading to the South Pole tomorrow, you do not have to be scrupulous about the balance of food groups. I don’t care for sweet muesli so I omit the sugar and replace it with desiccated coconut. I also add flax seeds. But the possibilities are endless. In addition you can add fresh fruit when you serve it – bananas and strawberries work well. Milk is the common moistener, but I often use juice instead, which also obviates the need for additional sugar. Yoghurt works too. Mix all the ingredients thoroughly in a bowl and store in an airtight container. What could be simpler? If you have a hankering for granola instead, spread the oats in a single layer on several baking sheets (drizzled with honey or maple syrup if you like), and bake in a 350°F/175°C oven for about 20 minutes until golden, stirring the oats every 5 minutes to be sure of even browning. Let cool and then add the other ingredients.